On Monday, April 30th, three of us from the office headed to Harrisburg for Citizens for the Arts in PA’s first Arts & Culture Legislative Visits Day. It seems we end up in Harrisburg at least once a year to do visits and while it is not the favorite part of my job, it is a necessity. We had appointments with four legislators and/or their staff, and so we headed around the capitol building armed with our fact sheet from Citizens for the Arts and our own information piece. Our first stop was Senator Scarnati’s office. While we were not able to meet with the Senator himself, we did spend 20-25 minutes chatting with members of his staff. Just prior to leaving the office, we asked the staff what they appreciate seeing from us and how we could be best prepared for these periodic visits. Facts and figures summarized on one sheet was the number one answer, as expected, but the second item suggested was something creative that talks about who we are (we handed out a small, colorful booklet created by one of our staff). Legislative staff, especially in the capitol offices, are often approached by many organizations who they just don’t work with on a daily basis and who they’re not familiar with. And the best part of the visit – as we were leaving, a staffer (a male staffer) commented on the “artisan jewelry” I was wearing. The necklace was made by Paul & Cathy Stalker of Tioga, PA – a town within the Senator’s district. This scenario repeated itself throughout the day and ended up being a great advertisement for not only Paul & Cathy, but also small artisan shops in general and thePA Artisan Trails (Paul & Cathy are members of the PA Wilds Artisan Initiative). It was also great to see tables set up by the PA Artisan Trails Initiative, the PA Guild of Craftsmen and several Guild members. All reinforcing the information we had shared with legislative staff, particularly comments on economic development and partnerships with tourism and museum folks. A day of advocacy also became a day of marketing. So much of what we focus on in communications and marketing these days is focused on social media – what to do, what not to do, statistics, and infographics. But don’t forget the most powerful tools out there – face-to-face conversations and word-of-mouth. Over the past two months, my colleague and I have been going out to visit with various community groups to test our version of what we think our community knows we do and what our community actually thinks we do. And while most of the time what we think the public knows about us is, in fact, true, there have been a couple incidences where people did not know information that we felt was common knowledge. Not a good thing when trying to develop support. No matter how many press releases we put out; no matter how matter articles (with pictures) our local newspaper carried; no matter how much posting on Facebook or tweeting on Twitter; no matter how many e-Newsletters or e-Postcards. The information was either not getting to them or not sinking in. But since starting the face-to-face meetings, the interest and response has been exciting. People have come to us, rather than us going to them. So, no matter how much I love technology and know the power of using social media and other electronic forms of communication, I will always bow to the effectiveness of a face-to-face talk and the power of word-of-mouth. The point to my ramblings…don’t forget to get out of your studio every once in a while. Keuka Lake wineries host Viva Italia! The eight wineries of the Keuka Lake Wine Trail will hold their second event of the year, with the Italian-themed “Viva Italia!” on March 31 & April 1. Hunt Country Vineyards will feature a Tuscan-style penne pasta with their Classic Red. 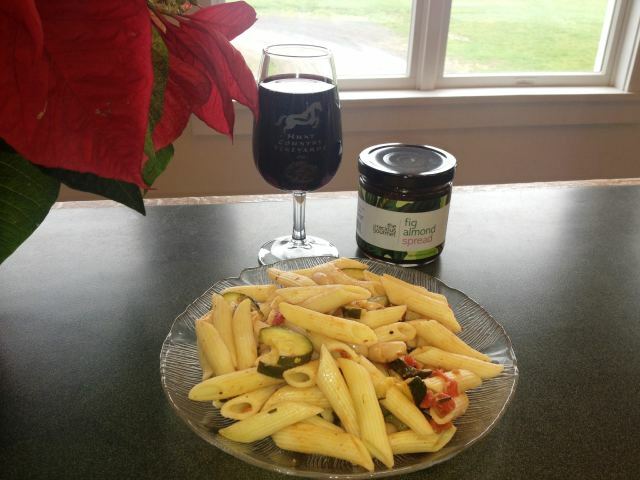 Down the road at Heron Hill Winery, visitors will enjoy a dish featuring the Emilia-Romagna/Bologna from the northern Italy region in a Penne Bolgnese recipe created by Blue Heron Café Director Mike Oliver paired with Heron Hill’s Game Bird Red. Tickets for the event can be purchased at any of the participating wineries for $30 for both days or $24 for Sunday only. Each ticket holder will receive a souvenir wine glass. Event hours are 10 a.m. to 5 p.m. on Saturday and 11 a.m. to 5 p.m. on Sunday. For additional information, contact the Keuka Lake Wine Trail at 1-800-440-4898 or info@keukawinetrail.com. Or visit them online at www.keukawinetrail.com. This week my work schedule includes a multi-day meeting at the Nature Inn at Bald Eagle State Park, so as I retreat to the PA Wilds, I’m also retreating from the topic of marketing/social media to share the wonders of the Inn with you. The Nature Inn at Bald Eagle State Park (Howard, PA) opened its doors in September 2010. The Inn is the first State Park-owned full-service lodging facility located in aPennsylvania State Park. The Inn was built with nature in mind and features “green” amenities and an ecological design featuring: reduced stormwater runoff; habitat restoration; native, water-efficient landscaping; a 2,800-gallon rainwater harvesting system; and lots more Park-friendly designs. But perhaps one of my favorite aspects of the Inn, other than the fabulous views of Foster Joseph Sayers Lake, is the use of local artists’ work throughout the interior. From the main lobby which features a glass mosaic by Dave Haring of Cat’s Eye Stained Glass to the bird prints by Ned Smith (20th century Pennsylvania artist and naturalist) found in each room throughout the Inn, the Inn offers a true local flavor not found in most lodging facilities. The butternut wooden fireplace mantel in the common room was handmade by Briar Hill Rustic Furniture along with oak frames by Elkwood Arts and two large wooden chainsaw-carved sculptures by Appalachian Arts. The inclusion of these items was a big step for the State Park system – and for that they get a big two thumbs up! So, on these warm March days as you start daydreaming about summer vacations, be sure to include our own Nature Inn at Bald Eagle State Park! Check out my latest article posted on Examiner.com: Finger Lakes wineries greet Spring with March events! Tons of fun events around the Lakes in March! Enjoy Trail events on Keuka, Seneca and Cayuga Lakes plus lots of event on the wineries. Check it out! This change represents a great opportunity for businesses, but in particular, arts-based businesses. The new format relies heavily on the visual and gives artists a great opportunity to really highlight their work. The new format also allows users to post things along the “Timeline” of their life or work. In my work with the Bradford County Regional Arts Council, I’m already starting to think how I can use that for the organization’s advantage. It seems that it will fit perfectly with our upcoming 100th and 125th anniversary celebrations for our historic theatres. Rather than posting photos of the theatres in one large album, I can place them along the Timeline to show an accurate history and progression for each building. The possibilities for telling the story of each building, and the organization overall, are exciting. In a sense, it becomes an online scrapbook. For an artist, think of how you can show the progression of your work over the years. By placing images of your work along the Timeline, your page visitors can get a sense of how your work has evolved and even events that had an impact on your work. Still not sure? Check out this Mashable post with projections of what the new Timeline could look like for some of the major brands. Still not ready? Have no fear. It is anticipated the roll-out to the new format for Pages will be a gradual process, as it has been for Profiles. If you haven’t yet switched to the new Timeline for your Profile, take the jump and start getting used to how it works. And start reading up on the new format. This post from Inkling Media has some great tips. Feel like you’re spending your life tracking down fellow artists or favorite sites onFacebook? Create Lists – a practice I already use in Twitter (where it’s called “Searches”) to get a quick overview of the chatter on specific topics or by specific groups. The idea, and knowledge, to do this on Facebook came to me today in a Social Media Examiner post shared by fellow communications pro, Carol Fingar. Social Media Examiner is a great site to follow for social media tidbits. Creating Lists on Facebook is a good way to group Pages or Friends so you can take a quick look at their status updates without scrolling through your main news feed. It also helps ensure that you will see the post, since your main news feed uses Facebook’s mysterious algorithm to populate your news feed. And if you have Friends and Pages that you want on one list – you can do that too! Just create the list from Friends and then add Pages, or vice versa. There is also an option in the top right of the list page to add individual Friends or Pages, rather than choosing from a list. Also in the top right corner of the List page, you can manage your list by adding/removing friends/pages, deleting the list, renaming the list, and even choosing which types of status updates are shown on the list. And don’t worry, you’ll still have your normal news feed!